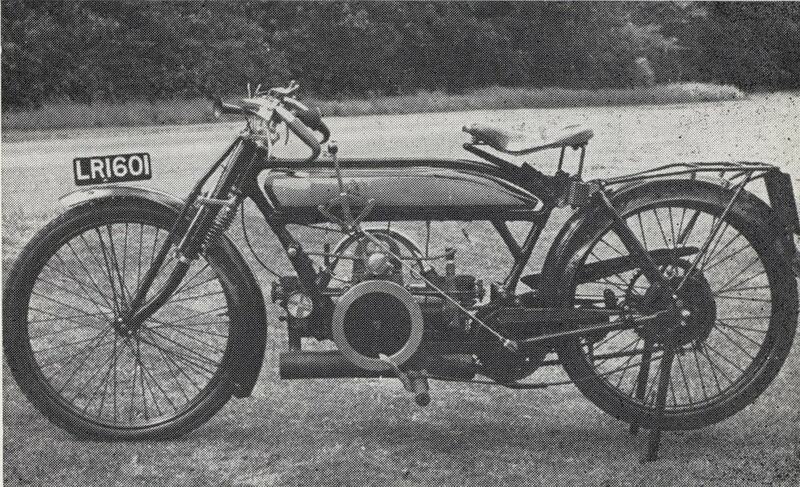 In late 1912 S. L. Bailey, who rode Douglas motor cycles at Brooklands, asked Bradshaw to design various parts to improve the performance of one of his bikes. These included machined cylinders, new con-rods, and new valves, tappets and rocker gear. In this form it proceeded to take the Class B (350 c.c.) kilometre and mile records at 72.63 m.p.h. and 70.04 m.p.h. respectively, beating the 68.28 m.p.h. and 67.85 m.p.h. previously set up on the Martin-J.A.P. The fact that Bailey had asked for revised motor cycle parts probably sparked off in Bradshaw's mind the idea of the A.B.C. motor cycle, and by January, 1913, a 500 c.c. opposed-twin engine had been designed and built, which, it was claimed, would fit most frames. In an article in Motor Cycling for 14th January 1913 describing this engine, it was also mentioned that there could be a 900cc flat twin suitable for a cyclecar, not that the company had any serious intention of making one themselves, rather that it might be an opportunity to supply it as a proprietary unit to others. This motorcycle engine had a bore and stroke of 68 mm. x 68 mm. and employed a three-throw crank, with one large con-rod centrally, and a lighter section con-rod either side to the second cylinder, thus obtaining very good balance. The cylinder barrels were machined from a solid bar and together with the con-rods, pistons and overhead valve gear were all based on aero-engine practice, The fin arrangement on the cylinders was described as "pear shaped", which were finished in nickel plate left dull. A certain amount of adjustment was required to the majority of frames, so Zenith Motors and H. Collier & Sons were asked to design a suitable frame around the engine. The second prototype engine incorporated pressure-feed lubrication instead of splash, normal working pressure being about 50 lb./sq. in. at a speed of 4,200 r.p.m. In April, the A.B.C.-Zenith appeared at the track, in the hands of F. W. Barnes, although after this date little is heard of either the Zenith or Matchless-framed machines. The first production engines, which were available in June, in some cases found their way into Douglas frames, as these obviously lent themselves to the design of the A.B.C. unit. Various modifications were made to the engine during May, including revised valve gear, and the pear-shaped fins becoming longitudinally disposed. These engines were used in some of the T.T. machines that year, one being George Brough's, his own engine not being finished in time. Other motor cycles to use the A.B.C. unit included the Edmund and the coil-spring-framed P.V. (Perry Vale, London), one of the latter gaining a gold medal in the 1913 London-Exeter Run. 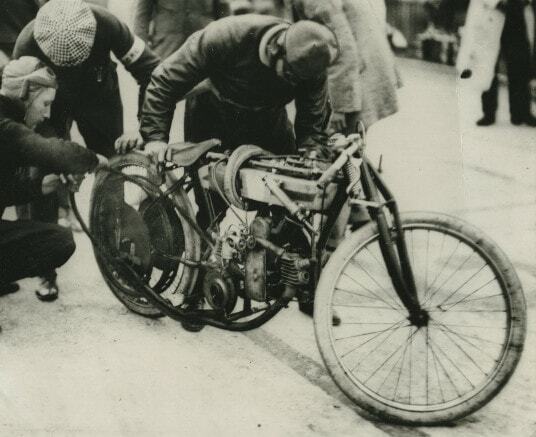 It became clear that the motorcycle engine only fitted very few frames and this likely prompted ABC to start building complete motorcycles themselves from 1914. On January 13, 1914, Jack Emerson, the company's chief tester, broke the Class C and D flying kilometre and mile records, previously held by Stanley on a Singer at 78.22 m.p.h. and 76.69 m.p.h., the new speeds being 80.47 m.p.h. and 78.26 m.p.h. respectively. For this attempt the bore was increased by less than half a millimetre, the rocker gear lightened, and a streamlined tail was added, consisting of aeroplane canvas stretched over a timber frame and attached to the rear of the saddle. In March, 1914, the new revised model was introduced, which differed in several major respects. A three-model policy was adopted, which consisted of the touring version with a guaranteed speed of 60 m.p.h., a T.T. model at 65 m.p.h., and the Brooklands model with a maximum of 70 m.p.h. The touring model had parallel-sided cylinders, with detachable heads incorporating separate exhaust-valve chambers, the valve arrangement changing from overhead to side inlet and overhead exhaust. A more normal two-throw crank was used, with ball and roller bearings, and a Best & Lloyd semi-automatic lubricator was added to the oiling system. In his record attempts, Emerson found that a certain amount of speed was lost due to the belt slipping on the rim, so 1914 models all had chain drive to the rear hub via a countershaft and three-speed Armstrong gear. The frame had for the first time a feature for which A.B.C. became renowned, namely the use of laminated springs fore and aft. On early production versions a kick starter and footboards were optional, whilst an undertray was standard to save mud and grit from liberally spraying the valve gear, as were twin exhaust pipes and silencers. The T.T. model retained the pear-shaped cylinders, as did the Brooklands model, which probably had lightened valve gear and drilled con-rods. About this time it was decided to give the motor cycle division of the works a separate title, so as not to be confused with the aero-engine side, and the name A.B.C. Road Motors (1914) came into being in June 1914. Not that much confusion could have taken place anyhow, since the number of employees at this time was about 20, which in turn was about double the number at Redbridge back in 1911.